Charm City continues its "worst to first"sprint of Bicycle Friendly Northeast Corridor cities. While Baltimore is still has a relatively low bike lane mileage count the city is not afraid to try innovative design solutions. 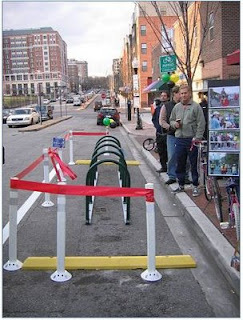 Sharrows and parking meters converted to bike racks are still in the planning stages here in Philly. On Friday an in street bike corral made its debut in the Charles Village neighborhood.